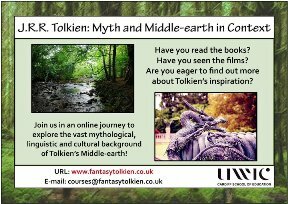 Tolkien and Fantasy Online Courses at UWIC to Run Again in May! The two online courses I run at UWIC last autumn will run again in May, starting on Monday 23rd May 2011. Enrolment is now open! 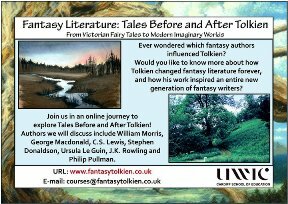 Fantasy Literature: Tales Before and After Tolkien (Year 3 undergraduate level) will examine the origins and development of fantasy literature from the 19th to the 21st century, exploring key texts such as Charles Kingsley’s The Water Babies, J.M. Barrie’s Peter Pan, J.R.R. Tolkien’s The Lord of the Rings, C.S. Lewis’s The Chronicles of Narnia, Ursula Le Guin’s Earthsea cycle, Philip Pullman’s His Dark Materials and J.K. Rowling’s Harry Potter series. J.R.R. Tolkien: Myth and Middle-earth in Context (MA level) will explore in detail the mythology, medieval inspirations, linguistic invention and cultural context of J.R.R. Tolkien’s fantasy work. For more information on both online courses visit this page, and see here for Frequently Asked Questions. Also, today I gave a short interview on BBC Radio Wales for the Jamie and Louise show, commenting on Fantasy Literature. The occasion was the Royal Mail’s issuing a series of Magical Realms stamps with characters from British Fantasy books. You can listen to this interview here (see also under ‘Media’). ← Tom Shippey Lecture at UWIC – all welcome!